Conor Chaplin has told of his satisfaction at life with Pompey. The Blues’ prized asset has spoken of how he’s feeling content in his surroundings after committing his future to the club. Chaplin agreed a new extended contract earlier this month which carries him through to the summer of 2019. The Academy graduate signed a three-year deal last year after making an impressive senior breakthrough. That has now been extended by another 12 months as Pompey protect their asset, with the likes of Brighton being linked with the striker. Chaplin also sees the deal as a reward for the progress he’s made since making his senior debut at the end of 2014. The 19-year-old has bagged five goals this season to add to the 11 strikes he grabbed last term. He feels his happiness to sign the contract reflects how he’s enjoying his time with Pompey. Chaplin said: ‘It’s great to get it signed. ‘I’m glad the club have given me the opportunity to tie myself down here. ‘The longer it is the more settled I feel – and I feel more settled. ‘The way the fans are with me is a dream. I never expected it to be like that. ‘I’m still pinching myself a bit, especially when you are walking off the pitch and they are singing your name like they were on Saturday. ‘You can’t believe it, especially when my dad, grandad and brother were in the stand watching. You can’t explain the feeling that gives you. ‘It didn’t take long to do. (sign the contract). Fair play to the club. ‘I’ve scored a few goals now, so I’d like to think it’s reward for that. ‘I signed my deal this time last year. It’s not been a long time but I’ve scored about 15 goals since then. So I like to think it’s a reward. Chaplin also has now made 62 senior outings, making him one of the highest appearance makers at Pompey. A total of 45 of those appearances have come off the substititues’ bench, with 17 starts – although he is currently on a run of seven league starts on the bounce. Despite that number of games to his name, Chaplin was remaining coy on the suggestion he is now an established Pompey first-teamer. 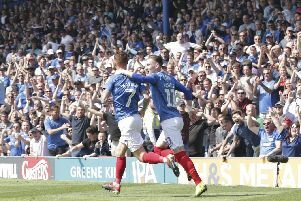 He does feel, however, he has gained the appreciation of his Pompey team-mates. And with Chaplin settling into a new home, he’s feeling comfortable with his situation. He said: ‘I don’t know about established but I feel important. ‘You have to gain respect from the lads and I definitely feel I’ve got that. We have a tight-knit group.